One of the reasons I had booked Dar Les Cigognes was because I had read great things about their cooking class. We flew into Marrakech around noon on Friday, so I had booked a class for 3pm that same day. We weren't planning to take any other tours while in Marrakech, so I was using this cooking class as time for us to learn about the culture and kick start our weekend in Morocco. We met Pierre in the riad courtyard, and I learned at that moment it would be a private class. (we've only done cooking classes with a group). We decided on our menu and then we were off to the local market! And when I say local market... I mean - legit - local market. Fresh (live) chickens, preserved lemons, gorgeous roses, as well as fresh bread being baked. I don't think i've ever eaten chicken that fresh before... and I will admit - it was tasty! Luckily there is a butcher there which 'prepares' the chicken, so we didn't have to take a live chicken home. I don't think I could handle that! After the tour through the market, we were back at Dar Les Cigognes for our cooking class. 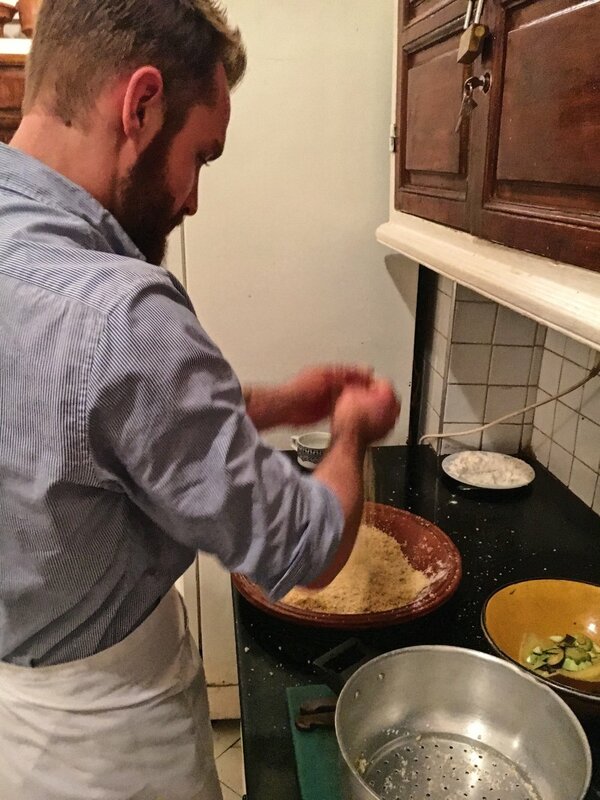 With some wine in hand, we began to learn all the secrets of Moroccan dishes. We also made chicken tagine as well as traditional "salads" aka vegetable starters. It was such an amazing experience to learn these traditional dishes from a true "Dada", a traditional moroccan cook. She was such a sweetheart, and paired with Pierre we were laughing throughout the entire class. We decided to have our meal on the rooftop terrace of Dar Les Cigognes, and clearly that was the right decision. First we started with the 4 "salads" aka vegetable starters. And then we went onto our vegetable couscous & chicken tagine. This was such an amazing way to start off our mini-holiday in Marrakech. Now... onto the Souks for some shopping! Learning new local recipes is the best souvenir you could take home.